This week’s message comes with an illustration, a scan of the front cover of the latest edition of the Railway Gazette. I mentioned this issue briefly at the end of last week’s message in conjunction with the open house at Spec Machine, where people could learn about the work taking place on the running gear of the former Chicago & North Western steam locomotive No. 1385. Now I want to make the magazine the feature of what I have to say this week in order to express my thoughts on what it represents as part of that campaign. The decision was made at the start of the fund raising campaign for the locomotive’s restoration to make sure some news item appeared in each issue of the magazine related to this project. This allowed us to keep the project a current topic of interest, especially as we were encouraging people to donate to help us meet a $250,000 challenge grant offered by the Wagner Foundation. But it also allowed me to fulfill a second and longer standing goal, that of using the December issue as a special, expanded edition focused on a single topic. These special editions have always been something of a challenge to complete. The emphasis on the depth and length of the content required us to find someone, whose personal research met our need. That person also had to have some ability, let alone the discipline, to write about a topic based on research that was little more than a hobby for them. Our own history with No. 1385 and the museum’s archives provided us with the materials needed to meet this challenge. And it allowed me the opportunity to exercise my own latent gifts by being both writer and editor of the text. Without asking permission of anyone, I used my access key to the museum’s office and in a covert operation removed the 1385’s files from the archives. Having them safely stored at my home office made the research part of the process a little easier to perform. And the materials were always on hand during these early morning writing sessions, which characterize my work. Since my childhood days, afternoons have been meant for play. The serious takes place before 10:00am. The special edition Gazette we did in 2011 was a fairly singular effort. The content was based almost solely on what I could find in the archives, offering a broad overview of the locomotive’s history since its purchase for the museum. I quoted heavily from prior issues of the magazine and scanned previously published images as our only means of illustrating the text. But it led us to a follow-up article by one of the original engine crew members, who operated No. 1385 during Mid-Continent’s first year (1963) at its new home in North Freedom. It was gratifying to have some participation from a person who had hands-on experience with the locomotive during those early days. Interim Gazette issues reported on work taking place with No. 1385’s tender and cab. The next special edition of the magazine again relied heavily on the museum’s archives to tell the story of how the locomotive came into pre-eminence as Mid-Continent’s star performer after seeing very little service since its 1963 debut. 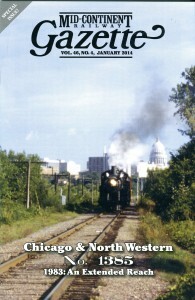 The article revealed the back story that led to the locomotive’s involvement with the Prosperity Special, a public relations event staged by the Chicago & North Western Railroad. The plan was to use one of its former steam locomotives (No. 1385 being the only one functional) to pull its modern equipment to destinations along its rail network as a means to showcase the company’s impact on the economies of those communities. This was 1982 and the plan worked well enough that the powers that be at the North Western asked if they could also take No. 1385 to Boone, Iowa that same year as part of the town’s celebration known as Pufferbilly Days. At each location the steam locomotive was the principal draw and it inspired the North Western’s officials to negotiate further with the museum’s leaders to allow them to run No. 1385 the following year on a much expanded tour over a larger part of its system. The locomotive subsequently became the gem of the museum’s collection and Trains Magazine dubbed Mid-Continent the “Midwest Ambassador of Steam”. For our more immediate purposes the special edition about those first excursions in 1982 produced an unsolicited photo essay by another one of Mid-Continent’s members, who happened to take photographs of the locomotive during one of its moves on the North Western. This gave us our first opportunity to published previously unseen images relevant to the story we were trying to tell. It also sent a subtle message that, yes, we would like to have others help us tell the story in order to generate more enthusiasm for the campaign. Fast forward to this most recent special edition Gazette reporting on the excursions which took place in 1983. Once again the museum’s archives were the primary source of information with regards to correspondence and newspaper articles. But there is a dearth of photographs to be had amongst these documents. Fortunately the word was out about the intended topic and Mid-Continent members came forward with those rail fan pictures they took when they chased the train along portions of its well publicized route. This type of buy-in by those who wish to participate in telling No. 1385’s story is a much welcomed addition to our efforts. The open house at Spec Machine, reported on in last week’s message, is another example of the desire by others to help promote the project. If you visit the museum this summer you will see new displays in the depot which support this campaign with more history and images about the North Western and its steam fleet. And there is an enhanced web page easily accessible on Mid-Continent’s web site which provides current updates about the restoration work taking place on No. 1385, now focused on the work taking place at Spec. The growing sophistication of the campaign to restore the locomotive mirrors the expanded use of No. 1385 during the glory years of the 1980s when it could be seen in operation over ever increasing miles on the North Western’s system. The locomotive became the image of Mid-Continent. The number of people engaged in staging these events can only be described as innumerable. And the attendance at Mid-Continent’s North Freedom venue increased. Growth is imperative for any operation that wants to stay in business. And for me the content of this special edition of the Gazette offers the evidence that growth is taking place once again as measured by the number of people involved in the program, the extended reach of the message, and the subsequent financial benefit we see through an increase in the number of donors contributing to the campaign and the size of their gifts. We are a long way from seeing a completed steam locomotive in operation at North Freedom. The running gear work alone is estimated to require another two years worth of full time work. But progress is being made and the collateral benefits are being seen as we continue to promote the campaign to restore this valuable relic listed on the National and State Registers of Historic Places. 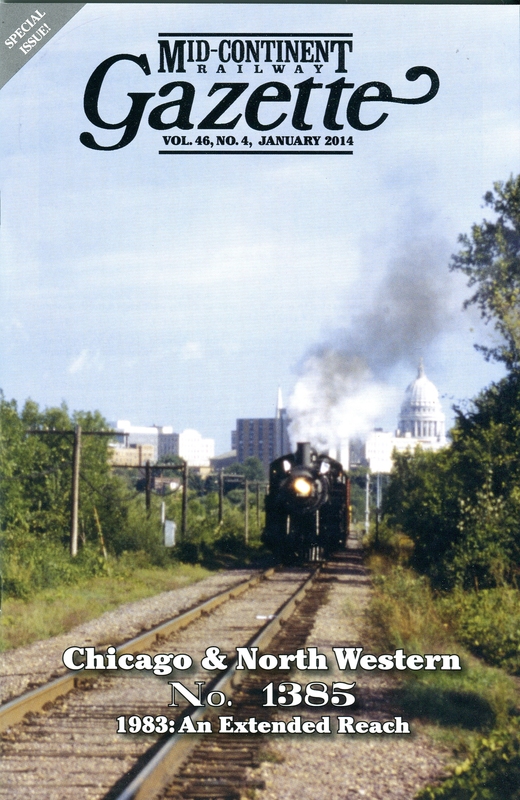 If you are not a Mid-Continent member but would like to obtain a copy of this issue of the Gazette, you can purchase them by calling the museum’s office at 608-669-1385. This entry was posted in Uncategorized on February 24, 2014 by Don Meyer.